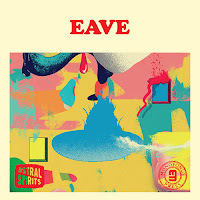 "Eave" is a new quartet of young Canadian avant-garde musicians, of whom Anna Webber is possibly the best known to visitors of our blog, as she was reviewed only a month ago as a member of Adam Hopkins' "Crickets" album, and of course known by her own acclaimed albums with the Anna Webber Trio, the Anna Webbber Percussive Mechanics, and her collaborations with musicians such as Jim Black, Matt Mitchell and Harris Eisenstadt (most of them reviewed). She is joined on alto by Erik Hove, on drums by Evan Tighe and by Vicky Mettler on guitar. The latter also performs as an 'avant-garde singer-songwriter' - if that exists - under the alias of Kee Avil. The four musicians create quiet but intense soundscapes, as if the order word is to create as little volume as possible, with as much possible power, very much in the idiom of European free improv. And they succeed. Together, the small bursts of sound clutter together and bind themselves like atoms clicking together to form molecules, and once in a while a tone on one of the saxes is sustained. Rhythm is totally absent, but that doesn't mean there isn't a good sense of pace. There are no real outbursts of energy, the sound is contained and disciplined, raw, harsh and still in constant flux. It is at times wonderful to hear how they find a common voice as in the long "Axe Or Chisel". Despite the self-imposed restraint, there is a lot of violence and discomfort in the music, with suppressed emotions getting expressed in more subtle ways than usual. Some tracks such as "Denver Bob" are extremely dark and depressing even. The interaction between the musicians is impressive, as is their common language and sense of direction. They manage to create a sonic universe full of contrasts, paradoxes and intensity, rich in texture and ideas. This is not music made to please - it is actually rather the opposite of a crowd-pleaser - and this headstrong uncompromising vision is what we like. No pleasant walk in the park, but a rewarding hike that demands effort, over hard sonic rocks, and thickets of thornbrushes and thistles: hard authenticity.